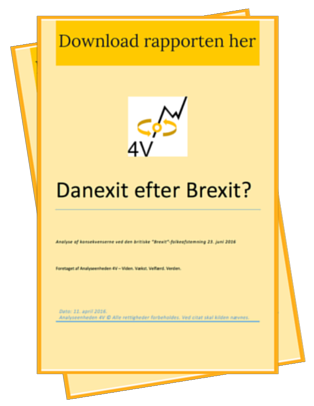 The following is the English summary of Analyseenheden 4V's report on "Danexit after Brexit?" You can get the full report by contacting us via email. The purpose of the analysis was to look at legal and economic ramifications of Great Britain’s referendum 23 June 2016. As was clearly demonstrated in the UK referendum campaign, significant uncertainties surrounded various macroeconomic scenarios. In the end, Analyseenheden 4V concluded there would be no immediate largescale economic downturn as a result of the Brexit referendum. Thus turned out to be right. As for the upcoming negotiations, it remains in both the EU’s and the UK’s interest to carry on trade with as little interruption as possible. For Denmark as a neighboring country and large trade partner, the ramifications of the British referendum are particularly significant. In April 2016, Analyseenheden 4V saw continued UK membership of the EU as a boost for longstanding Danish national priorities like free trade, better regulation and subsidiarity. As one of a select few think tanks, Analyseenheden 4V made a forecast that the Brexit vote vould at most affect UK GDP by plus/minus 1 percent. This forecast has so far turned out to be correct. Conversely in case of Brexit. Analyseenheden 4V concluded in April 2016 that Denmark will stand increasingly isolated, politically and economically, within the remaining EU. The Euro Group will become a dominant political factor and likely set an “ever closer union” agenda. Denmark's euro opt out places the country between a rock and a hard place. On top comes Denmark’s longstanding trade relationship with the UK. The two countries entered the EC together in 1973 and share similar business climates and outlook. This often results in a shared view of EU regulation and internal market issues. Ultimately, a majority of Danish politicians in Folketinget will likely follow the EU27 track and thereby enhance the country’s EU integration. If so, there will be significant voter concern. While several Danish opinion polls show significant support for Denmark's membership of the EU, the voter sentiment is also fluid. An opinion poll in March 2016 revealed a statistical dead heat between those who favour a Danexit, or Daxit.